This blog post was written by my daughter who spent four months with us in Hong Kong this summer. She really packed a lot into her time here, so I asked her to record it for my blog. Enjoy. I got to feel like a big kid working for a small classical music presenting organization that focuses on world-class chamber music and recitals. This is the same organization that mom first worked for here; thanks for the introduction! My work was mostly focused on fundraising, but I also did lots of English writing for marketing materials, website text etc. I learned lots and had fun! Hong Kong is full of amazing (and steep) hikes, many of which are right in the backyard of mom and dad’s apartment, literally at their doorstep. 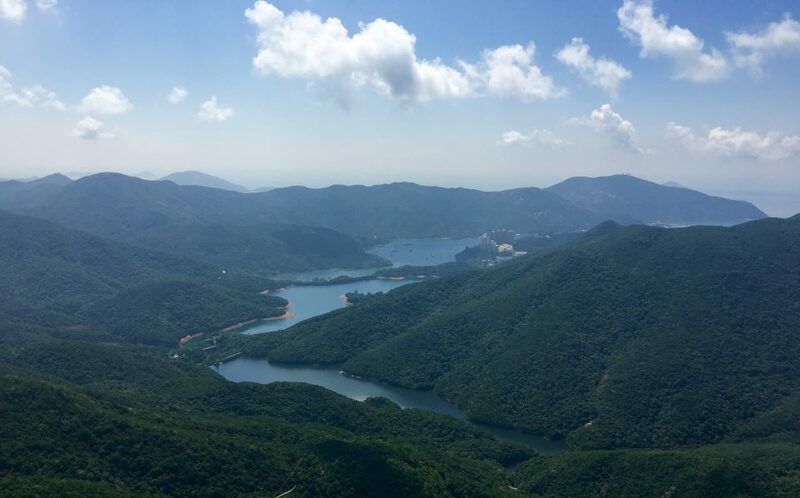 Hong Kong is very rocky and mountainous, and as a result has lots of great rock climbing. I met a great group of climbers through an online Meetup group and spent many weekends climbing at the region’s crags. One of the most amazing things for me was the accessibility of these crags. Coming from Canada, I am used to driving hours to reach outdoor activities; by contrast, all of the Hong Kong cliffs that I climbed were accessible by public transit. Sometimes the density can be very convenient. That’s me in red halfway up the cliff! Through another Meetup group I was able to spend Tuesday nights slacklining at the ferry pier on Victoria Harbour. It was a great way to spend some evenings with nice people from all over the world in a great location. 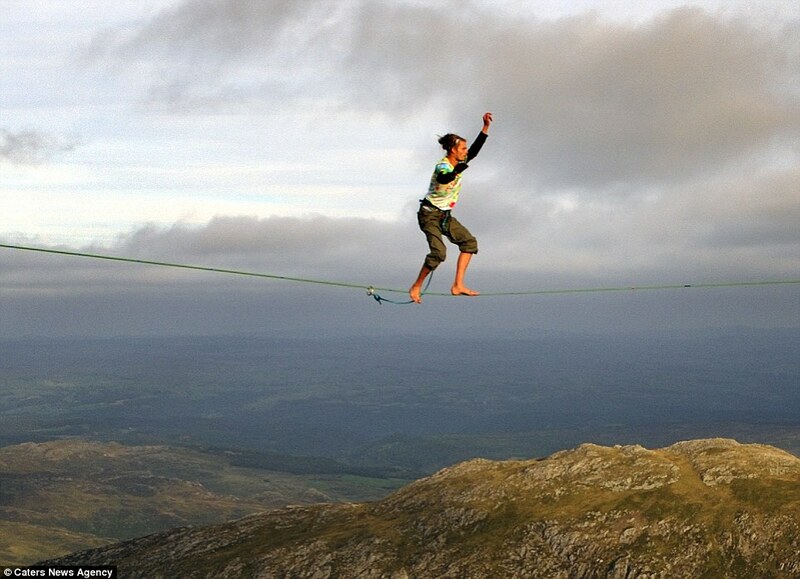 OK, this isn’t me, but this is what slacklining can look like. I was doing this in Central with the lines connected between pillars. Not quite so high as this … maybe next time! My first trip of the summer was a week in central and south Vietnam. This trip took us from the historic cities of Hoi An and Hue to the bustle of Ho Chi Minh City (aka Saigon) in the south. Great food, friendly people, and really interesting history. I would definitely go back to see other areas of the country. My last trip of the summer took our family to Angkor Wat, the incredible collection of ancient temples near Siem Reap in Cambodia. These temples are incredibly well preserved, and it’s easy to see why this has become one of the most iconic historic monuments in the world. I did my best to explore as much of this awesome city as possible. I took hour-long walks around my office during the week, getting to know the Wan Chai district very well. Weekends took me further afield, exploring different neighbourhoods, parks, fishing villages, and islands. Many people don’t realize that only about 25% of the region of HK is actually developed, leaving the other 75% protected green space. There is easy access to parks and green space unlike any city I have ever visited. I was able to spend lots of time outside with no buildings in sight, even though I was only a short transit ride from some of the densest places on the planet. One of my favourite aspects of the city is its incredible diversity. Each neighbourhood has a very unique and distinct character, so no matter where you go, you will find something interesting to explore. Overall this summer has been a really fantastic experience. Being in HK for several months and having a job meant I was there more as a local than a visitor, making it a very different experience. Like mom said right from the beginning, it is a very liveable city, and a great place to explore as a local. The people of HK, both locals and expats, are extremely friendly and welcoming to newcomers, making it easy to fit in and find a social group. I am so thankful for all the adventures of this summer, and I can’t wait for more when I come back! Ainsleigh has returned to Canada where she will do her final term at the University of Guelph. She will be finished in December, and then who knows?! Likely more trips to Hong Kong — I think she liked it here! What a fabulous dissertation of 4 months in HK. I felt myself moving through the countryside and up the steep slopes with you. Loved your photos and descriptions. Thanks for sharing. Are you adopting anytime soon…pick me! Interesting summer summary Ainsleigh! Welcome back to Canada. Loved reading this! Thanks Ainsleigh and have a wonderful school year!